Happenings: Out of the Mouth of Babes ... Into the Mouth of Babes? Out of the Mouth of Babes ... Into the Mouth of Babes? 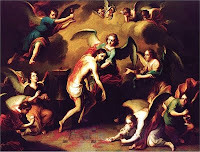 Back in 1997 – 1998, from the Feast of Saint Thomas (21 December) through the Feast of the Resurrection (12 April), the Museum of Fine Arts in Houston, Texas organized and hosted a special exhibition entitled The Body of Christ in the Art of Europe and New Spain 1150 – 1800. Our family made the trip from Jasper to Houston to see the show. This exhibition was divided into four sections, The Word Made Flesh, Suffering and Triumph, The Eucharistic Body, and The Visionary and Devotional Body. The first two were somewhat straightforward, Scripturally based renditions of scenes from our Savior’s life, suffering, and death. 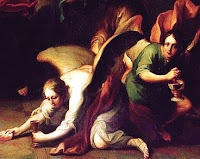 The third was largely figurative while the fourth included such mystical events as The Stigmatization of Saint Francis, The Mystic Marriage of Saint Catherine, and Saint Catherine of Siena Drinking from the Side Wound of Christ. With us that day was our younger daughter. 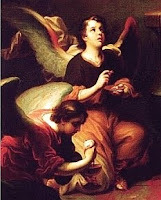 Laura celebrated her sixth birthday that Lenten season, less than a month before the exhibit closed. My fatherly and pastoral curiosity had the better of me. I asked her what was going on in the painting. She’d already been studying it but renewed her concentration, evidently wanting to make certain that she got her interpretation correct. There we were, in the midst of Lent, half way through an exhibit that included many depictions of the Passion. After daring to ask her such basic questions, I was thankful that Laura hadn’t added “You dummy” to one of her replies. We took a few minutes to talk about the historical events of Good Friday versus the way these things make us think and feel. Once I knew that she understood how Ruiz had embellished the story, painting out of his own imagination, we returned to the painting. I asked what else she saw happening. Of course, “skin” wasn’t technically correct but how common was “flesh” to the working vocabulary of American six year olds at the end of the Second Millennium? She certainly knew what Mama and Papa and Courtney and the other big people were getting at the altar every bit as well as she knew what Ruiz’s painting depicted. Already I was no fan of making children wait until the end of their 8th grade years to commune. Laura’s brief explanation and confession sealed the deal. She could confess her sins; she could confess the Faith; she could discern the body (cf. 1 Corinthians 11:29). What else did she “need” to do to gain admission to Christ’s altar? Eleven years later, her replies to my questions still make so much more sense than do the answers of much of Lutheranism to this final query: Why did her church tell Laura and many like her that they could not commune until they were older? Art commentary quoted from The Body of Christ in the Art of Europe and New Spain 1150 – 1800 by James Clifton, © 1997 by the Museum of Fine Arts and Prestel-Verlag, Berlin. All children have their own age of reason.